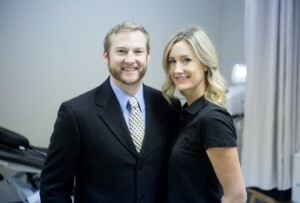 Chiropractor Dr. Mark Johnson and physical therapist Jessica Johnson are a husband-and-wife team working together to improve the health of people in our community. Opened in 2007 by Dr. Johnson, Jessica joined him in practice in 2013. Once you enter their practice you will immediately feel at home. The environment of the office is professional yet upbeat, energetic, and positive. “We have made our office feel like home,” states Jessica as she describes the addition of a fireplace to their waiting room. “Jessica and I are blessed that we are able to work collaboratively to help others to improve their lives. We share the same philosophies regarding treatment approaches and recognize each other’s strengths in our respective fields, so we can utilize each other’s knowledge and skills to offer our patients the best treatments possible,” Dr. Johnson explains. Jessica is happy that they can be role models for their 2 young boys, Austin and Chase. “I love how our kids can see our hard work, see our excitement as we help others and see our practice grow. Although they are still in the early elementary years, they already feel they are part of the practice and want to help others as we do.” Jessica describes. Get all that you can out of life with a body that functions at its highest abilities. Contact us today to discuss what we may be able to do for you! We welcome the opportunity to meet you and assess your needs.